I visited the River Wensum today as planned. My son Leon could not make it as he was going out with my wife. I arrived around 6am and it was very foggy. The river was a bit more coloured than normal and I thought I may have a good day. I set up in a deep swim which I haven't fished for quite a while. The plan was to have my Greys Prodigy rod with centrepin set up for the Barbel and chub using pellet and my Wychwood Rogue barbel rod set up with a baitrunner for the perch. I planned to alternate between the two rods every hour. I had been set up for about 20 minutes with the centrepin out when I had a bit of a knock on the rod tip. Too quick for me to strike at. There was quite a bit of weed coming down the river which was a bit annoying at times. After about half an hour of arriving I noticed another angler had set up in the swim to my right. I popped up to say hello and he introduced himself as Ed. I watched as he reeled in a few dace. He was fishing maggot on size 14 hook and was having some success when we noticed a pike following one of his hooked dace in. Suddenly the pike grabbed the dace and the fight was on for about 30 seconds before the pike bit through the line. The pike was a definate double figure fish. Just then Ed's mate arrived named Ian and we had a chat about the conditions and it turns out, both Ed and Ian were from Epsom in Surrey and were down for the whole weekend. They had fished the stretch also on Saturday and had lots of fish, mainly Dace and Perch but nothing majorly big. Ed set up again but this time using a trace and a small spinner. After casting around for about 5 minutes he had another pike on which this time did not get away. Only a jack pike of around 5 pounds. Ed was made up as it was his first ever pike. I helped with the unhooking and mr pike went back to fight another day. I was kept pretty busy during the early morning by two persistant swans who decided to investigate everytime one of my leads was cast in or even if I stood up. Whilst this was going on my angling buddy Chris Roberts arrived. He had planned to drop into the swim next to me but no sooner had he cast out his swimfeeder with breadcrumb the swans were after it and actually managed to pick up his feeder off the bottom. 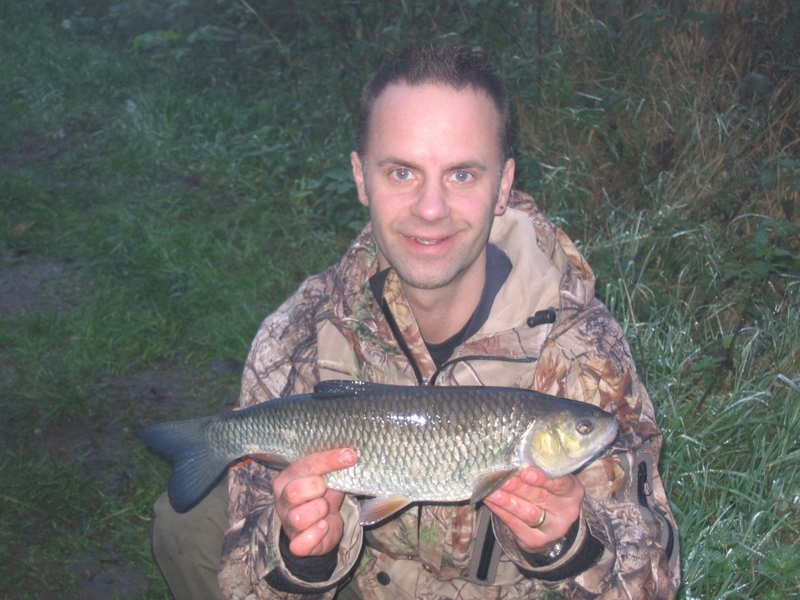 Chris moved about six swim down river and managed to catch two 4Lb chub within half an hour of arriving. Lucky sod. I carried on fishing my swim but just had a few knocks here and there no real proper takes. Around mid day I moved right to the bottom of the beat to fish under a bridge. I cast out my perch rod with the baitrunner on and first cast had a 1LB perch on 5 red maggots. Mint condition little fish and it put up not a bad scrap for a small fella. During early afternoon I had a few knocks here and there. About 3pm two guys came up for a chat and stayed for around 15 minutes. During this period I had the centrepin cast out under the bridge. We had general banter about what type of fish are in the Wensum and where to fish when my centrepin sprung into life. Line was being ripped from the spool pretty quickly whilst the clutch of the reel was singing. I grabbed the rod and struck and the rod arched beautifully. I was really hoping this was going to be a barbel by the way the fish tore off. As I tried to make out what fish was on a not bad sized chub appeared out of the dark water. I thought it would probably go around 3LB. Once I got him in the net he was a bit bigger than I first presumed as he was a bit thicker set. The chub was probably more near 4LB. See pic below. Not a monster but welcome all the same. Chris did not have any more after those first two chub. I had a few knocks later in the day but nothing really worth trying to strike at. The day was not bad. I met Ed and Ian and had some good fishing banter, had a few nice cups of tea and not a bad chub and perch. Next trip is currently being planned. I may try another different stretch of the Wensum or maybe even different venue.